The Internet and other websites are filled with misinformation regarding this subject, some of which puts many people into panic mode. It’s true – you will need to do some cleaning, but the most important thing to remember is that lice live on your head, not in your home! Keep in mind lice are parasites that need blood to survive. They can’t survive for more than 24 hours without food. Lice eggs can’t hatch off of your head, and they can’t reattach. For this reason, sterilizing your entire home is unnecessary. Lice cannot jump or fly – they are crawling, wingless insects. Lice are not a symptom of being dirty – they actually prefer clean hair. Symptoms include itchy scalp, red bite marks or red rash on nape of the neck. 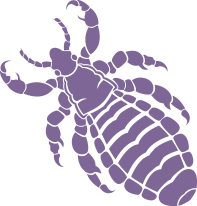 Lice cannot travel to other parts of the body. Over-the-counter lice shampoos do not kill nits or young lice bugs. Head lice cannot live on your pet. Anyone can get lice. Lice don’t care about your age, your gender, or your hygiene. Having lice doesn’t mean you are dirty! Lice is transmitted mostly through head-to-head contact. It’s more common in young school-aged children, but lice do not discriminate. If your child has lice, chances are that they’ve contracted it from a friend at school. Nap time, dress-up, circle time, and telling secrets are all common ways for lice to be spread. Lice can also (though less commonly) be spread through the sharing of hats, helmets and brushes. It’s contracted easily, so, if your child has lice, it’s important to have your entire family checked. A tickling feeling of something moving on the scalp or through the hair. Red bite marks caused by excessive scratching, or a red rash on the back of the neck. What are head lice and what do they look like? Head lice are tiny, six-legged, wingless, blood-sucking parasites. They can’t fly or jump but they can crawl quite quickly! Live lice can range in size from 2-4mm. The baby lice (nymphs) are extremely small, about the size of a period. They will be transparent and are often extremely difficult to see. Adults can vary in color from grayish white to reddish brown. Like a chameleon, they can camouflage to fit their surroundings! They live flat on the scalp and are also difficult to see. What are nits and what do they look like? Nits (louse eggs) are very small, about the size of a sesame seed. They are laid by the adult female and are attached at an angle to a strand of hair with very strong glue. They are yellowish, tan or coffee colored ovals. They are often found near the crown of the head, around the ears and near the nape of the neck. Nits take 7 to 10 days to hatch. How can I tell if it’s a nit? Nits are glued to only one side of a strand of hair and will be difficult to remove. You will need to slide a nit all the way down a strand of hair with your fingernails. They will not blow away easily like dandruff will. Where should I look for lice? Begin looking for nits near the scalp, around the ears, and near the nape of the neck. Nits will be small, tear drop-shaped, and yellowish or tan in color. They are attached to only one side of a strand of hair. If you don’t see anything there, then check the other areas of the head. If you are not sure if you are seeing a nit, blow on it. If it stays attached to the hair, then it could be a nit. If you do find nits, there is a good chance you have lice bugs too. Nits cannot appear by themselves. What is the life cycle of lice? Lice can live for up to a month and can lay up to 10 eggs a day. An egg takes 7-10 days to hatch into a nymph (baby louse). A nymph takes 7-10 days to mature into an adult louse. Only adult lice bugs can lay eggs. Nymphs are extremely small, about the size of a pencil dot, and they are extremely difficult to see. They live flat against the scalp where they can constantly feed on blood. In a week they mature into adult lice bugs and become grayish white to reddish brown. Once mature, they mate and begin laying eggs all over again. My head doesn’t itch. Can I still have lice? Yes, itching is caused by an allergic reaction to the bugs’ saliva. Only 50% of people infected develop itching symptoms. If you do experience itching, removing the bugs will alleviate the irritation, but not always immediately. Will adding gel to my child’s hair prevent him or her from getting lice? Unfortunately, gel does nothing to prevent head lice. It is better to take the extra time to brush hair and pull it back. A spritz or two of mint spray may help as well. Does having head lice mean I am dirty? Personal hygiene is not an issue with lice, so contracting head lice does not mean that you are dirty! They actually prefer clean hair over dirty, but having dirty hair will not prevent or hinder them from laying eggs in your hair. Will a haircut eliminate the problem? No, it would need to be a buzz cut. Lice are only interested in your scalp, so cutting your hair will not eliminate the problem. Can I wash away head lice? No, lice can hold their breath for up to 2 hours. They lock their claws onto the hair and hang on for dear life! They also have the ability to shut down their nervous system, and can remain submersed, unharmed, even in products intended to kill them. During laboratory testing, lice were found to play dead for up to two long hours! Nits are coated with a fixative substance that literally cements them to the hair. They cannot be washed away. No, but studies conducted by the Shepherd Institute show that mint is an effective repellent against head lice. Unfortunately, oil does nothing to prevent lice from laying eggs in your hair. This is a widespread misconception. More than anything head lice are an annoying inconvenience. The reactions lice may cause are usually mild compared with the chemicals found in most lice shampoos. The short answer is, not always. The products sold in drugstores or prescribed by doctors are called Pediculicides. Brands such as Nix and Rid are insecticidal shampoos and they contain pesticides, which may pose long-term health hazards to humans. These shampoos are sometimes effective against adult lice bugs but, unfortunately, are not designed to kill their eggs or their babies which is why it’s important to choose professional hair lice treatment. If left untreated, these nits and nymphs will continue to mature, beginning the infestation all over again. Read more about why we don’t recommend lice shampoos on ourWhy Shampoos Don’t Work page. How do I know when I am louse-free? If you are nit-free for 14 days straight after head lice removal, you have managed to successfully eliminate head lice.